Whinlatter is best known for its pass or its visitor centre, but is also the name of the fell on the northern side of the pass, a medium sized fell with an attractive summit ridge. 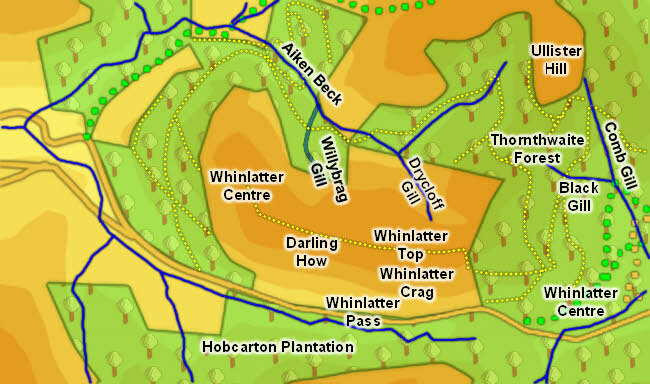 Whinlatter fell is part of the system of fells centred around Lord's Seat. Four ridges run away from this fell. The south-eastern ridge runs to Ullister Hill, then curves around to the south-west, dipping as it crosses Tarbarrel Moss before turning west and climbing to form Whinlatter. This fell runs west along the top of the pass and then curves north-west, so the overall ridge forms a semi-circle enclosing the valley of Aiken Beck. None of this is seen from the road, where the fell is seen as a single uninterrupted steep slope, bare of trees, looming over the pass. The northern slopes are more gentle, running down to Aiken Beck, where there is a mix of forestry and open land. Most of the fell is clear of trees, but the forests do cover the western and eastern ends and part of the northern slopes. There is only really one route onto Whinlatter (mainly because of the surrounding forests). Starting at the Whinlatter visitor centre head east along the forest track, taking the left-hand branch just east of the centre. At Black Gill double back. Cross over a crossroads and continue west to the edge of the forest. A path leads right alongside the forest boundary to the summit ridge, then turns left to reach the highest point on the fell. We have an ascent of Whinlatter Top from the visitor centre. The summit is a small rocky outcropping above the grass and heather on the longer summit ridge that runs from Whinlatter Top in the east to Brown How in the west. A tempting path continues on north-west from Brown How, but eventually dies out without getting anywhere and the route back along the edge of the forest is difficult. The southern boundary of the fell is formed by Whinlatter Gill, which flows west down the pass heading towards the Vale of Lorton. The northern boundary is Aiken Beck, which flows west between the fell and Aiken (an outlying spur of Lord's Seat). Towards the western end of the fell Whinlatter Gill becomes Blaze Beck. Aiken Beck drops over Spout Force and then joins Blaze Beck, marking the western end of the fell. Two becks rise on the northern slopes of the fell - Willybrag Gill below the summit and Drycloff Gill a little further east. This could also be seen as the north-eastern boundary of the fell, although that probably lies a little further north, at Tarbarrel Moss. To the south-east Comb Beck is a clear boundary, as is Black Gill to the north-east. The Forestry Commission visitor centre at Whinlatter Forest sits on the south-eastern flank of the fell.